AUTODIESEL TURBO FUEL SYSTEMS PTE LTD is a renowned & specialized company originally located at Sin Ming Industrial Estate, with well over 30 years of experience (operating since 1983), dealing in mainly diesel fuel injection pump, injector repair, alternator repair, starter motor repair, and turbocharger repair. We are the sole authorized distributor & service dealer of DENSO fuel injection pump & parts in Singapore. 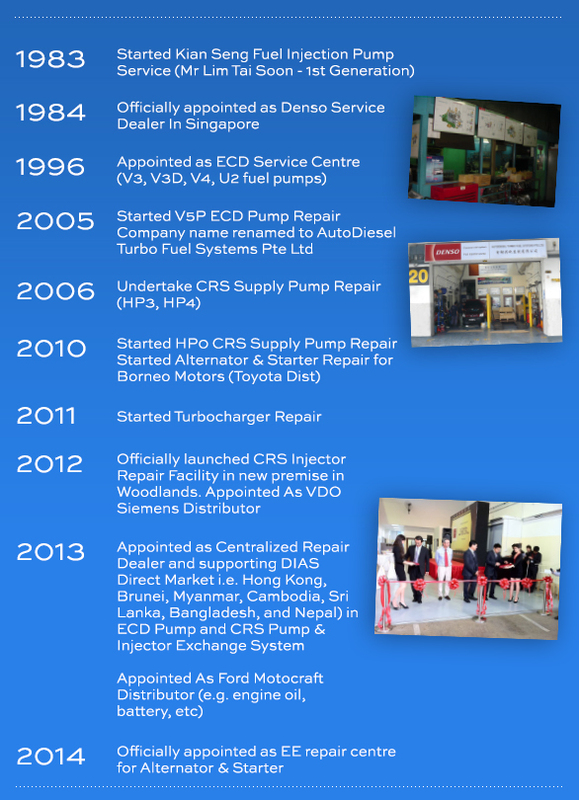 In 1984, we were officially appointed as the only Denso Authorized Service Dealer in Singapore with the first official repair of VE fuel pump with Borneo Motors Pte Ltd. In 1996, we were officially appointed as an ECD service centre by DNJP and DISP. We were trained in V3, V3D, V4, V5 and U2 at that time. Subsequently, in 2005, we have officially started repair for V5P fuel pumps as well. A breakthrough undertaken by our company in 2006 is the start of repair facility for Denso common-rail supply pumps. In early 2012, we officially launch our new Common Rail Injector Repair facility and setup our branch office in Woodlands. Our company reach another milestone with the appointment of Centralized Repair Dealer for Repair & Exchange for Denso Electronic fuel pump systems and Common Rail systems (Euro IV & V) by our principal, DENSO, in early 2013. AutoDiesel reached another milestone in 2014, being the first dealer outside Japan to be the official dealer for EE products (alternator & starters). The countries that we are supporting include Hong Kong, Brunei, Myanmar, Cambodia, Sri Lanka, Bangladesh, and Nepal. 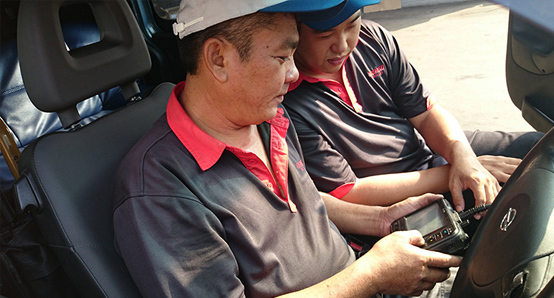 At AutoDiesel Turbo Fuel Systems Pte Ltd, all our mechanics and technicians are highly skilled in vehicle electronic ECU diagnosis, smoke inspection, fuel injection pump & injectors servicing, and general servicing of vehicle. Our workshop is equipped with the best and latest equipment to facilitate our mechanics in diagnosing of vehicle problems, removing, repairing and refitting of injection pump and injectors. Our expertise enables us to repair injection pumps and injectors for most diesel engines (buses, lorries, vans, forklift, taxis, container trucks, excavators and vessels).